BACTOL Disinfectant and Sanitizer is designed for use in hospitals, nursing homes, hotels, schools, athletic/recreational facilities/tanning spas, dairies, food service establishments, restaurants, bars, animal quarters and kennels where disinfection, sanitization and deodorization is of prime importance. Effective on: floors, walls, metal surfaces, stainless steel surfaces, glazed porcelain, glazed ceramic tile, plastic, surfaces, bathrooms, shower stalls, bathtubs, cabinets, tables, chairs, tanning beds and telephones. BACTOL Disinfectant and Sanitizer deodorizes those areas, which generally are hard to keep fresh smelling, such as garbage storage areas, empty garbage bins and cans, pet areas and any other areas, which are prone to odours caused by micro organisms. **Please note: To avoid excess foaming, pour water first and then BACTOL DISINFECTANT AND SANITIZER. precleaned inanimate, hard surfaces such as walls, floors, tables and counters. Apply BACTOL Disinfectant and Sanitizer with mop, cloth, sponge or trigger sprayer. Prepare a fresh solution for each use. 1) Add 22 ml of BACTOL Disinfectant and Sanitizer per 4 L of water (1:182) using the portion aid provided (32 ml/4 L for HIV-1 (Human Immunodeficiency Virus)). 2) Allow surface to remain wet for 10 minutes, and then remove excess liquid. BACTOL Disinfectant and Sanitizer, when used as directed, is effective against: Staphylococcus aureus; Salmonella choleraesuis; Listeria monocytogenes; Yersinia enterocolitica; Pseudomonas aeruginosa; Escherichia coli; E.coli O157:H7; Staphylococcus aureus (Vancomycin intermediate resistant); Influenza A-2/Japan; Herpes Simplex 1; Adenovirus Type 5; Vaccinia virus; Influenza A/Turkey/Wisconsin; HIV-1 (Human Immunodeficiency Virus); Newcastle disease virus; Laryngotracheitis virus; Porcine Respiratory and Reproductive Syndrome virus (PRRSV). FOR HIV-1 (HUMAN IMMUNODEFICIENCY VIRUS): Clean blood or body fluids from surfaces before applying BACTOL Disinfectant and Sanitizer. Wear protective clothing including latex gloves, smock, mask and eye goggles. Blood, body fluids, cleaning materials and clothing should be autoclaved and disposed of according to local regulations. 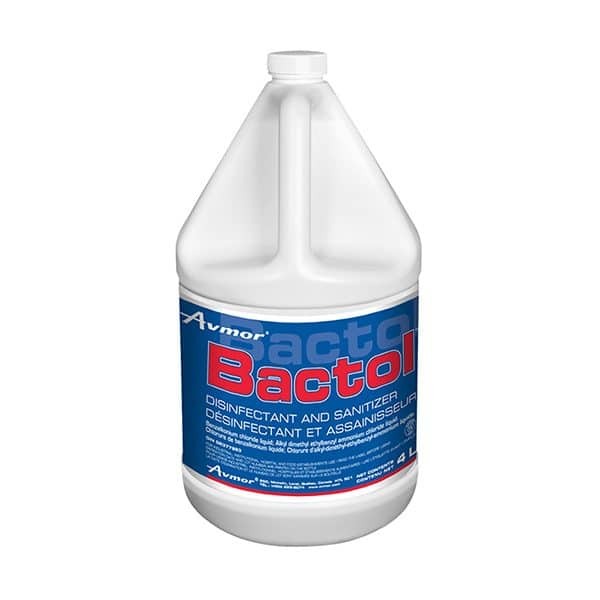 1) Prepare a 200 ppm active quaternary solution by adding 8 ml of BACTOL Disinfectant and Sanitizer to 4 L of water using the portion aid provided. 2) Allow solution to work for at least 1 minute, and then remove excess liquid. 3) NO POTABLE WATER RINSE IS REQUIRED. 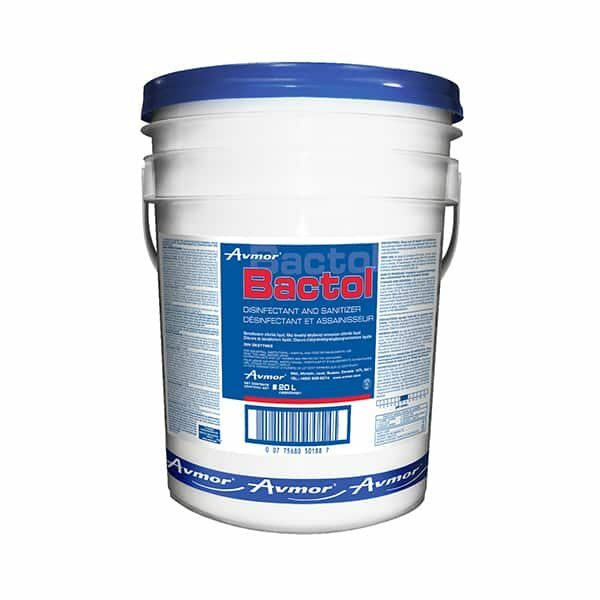 This product is an effective sanitizer when diluted in water up to 650 ppm hardness (CaCO3). When used as directed BACTOL Disinfectant and Sanitizer is an effective sanitizer against: Escherichia coli; Yersinia enterocolitica; Staphylococcus aureus; E. coli O157:H7; Shigella sonnei; Vibrio cholera; Methicillin resistant Staphylococcus aureus (MRSA); Vancomycin resistant Enterococcus faecalis (VRE); Klebsiella pneumoniae; Listeria monocytogenes; Salmonella typhi; campylobacter jejuni.